Welcome to Cheapskate4Life! Feel free to look around, enter my giveaways, and keep coming back for more tips on how to be a Cheapskate! The Envitote giveaway ends tonight so enter now! Looking forward to reading your blog!! I am a new follower. I hope you will come follow me too. 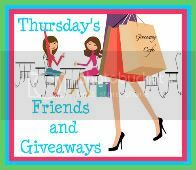 Following from Talkative Thursday blog hop. 40+ reviews and giveaways! We have some awesome sponsors!